Our Adventures are about having great experiences in very special places that are rich in natural wildlife, the fascinating features of our 200+ year old canal system, having fun, a time of personal growth, making new friends, being in two lovely 70' fully crewed narrowboats where we have an environment that is sincere and where there is time for you, where you will find great tasting, cruelty free, mostly organic, freshly prepared and highly nutritious meals, and a relaxed, smoke free, atmosphere. The canals have a wonderful history, heritage and culture. The boats are built traditionally, the butty which is pulled by the motor, has the same lines as the horse drawn boats of 200 years ago. Every day on the canals is different. No two journeys are the same. The environment on the boats is special and we endeavor to enable every Friend to have a truly wonderful experience with us. Some will really enjoy working the locks, steering the boats and 'bow hauling' the butty into locks and be very active. Many young people enjoy setting locks and learn to steer competently. We have kites and bikes and digital cameras that can be borrowed. Others will have a more relaxing time. Whichever people choose the ingredients are here. 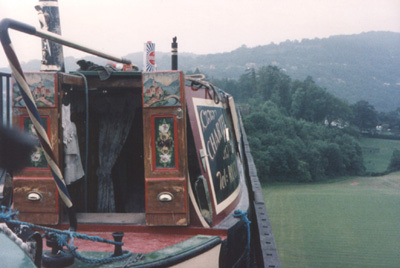 Additionally, every Adventure features different 'on the bank' attractions as well as the canal and river environments and their features, the boats and the things that we do on board. We're flexible and will do things on the spur of the moment. Imagine it's a beautiful moon lit night - we may well do some navigation. That's a special experience. Time with us is a phenomenon. The usual expectation of time just doesn't apply, so we create our own. A journey that may seem like an hour may have taken much longer. Something that occurred in the morning may seem like a different day by the evening. There are always tons of things to do, new friends and discoveries to be made, with fun on the water and interesting places nearby. And when you return to the boats in the evening after visiting an attraction you can print your digital images and save them to a CD to take home. We have internet access that you can use without charge to receive mail and send digital images of what you have been doing that day. We also have a Scalextric track that can be used inside or out. We have a range of on board activities, surround sound, books, games, chess and computer games. You can paint and take home your own items of canal art, using the same simple and effective brush strokes that working boatmen used in the 1800s.